Local drivers in the market for their next SUV may find it difficult to narrow down their options and make an educated decision. That’s why our team here at Certified Autoplex is working to provide detailed research pages for specific models available here in Carrollton. Although we have a wide variety of vehicles to choose from with over 20 brands, BMW makes up more than 15 percent of our inventory. Since we carry such a large selection of used BMW models, we decided we would dig deeper into the lineup to show drivers what this brand has to offer. 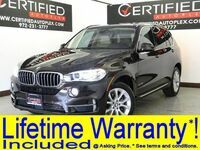 Here at Certified Autoplex, we specialize in used luxury vehicles, which is why you’ve come to the right place if you’re shopping for a used BMW X5. There are currently five models on our lot to choose from, but it’s important to keep in mind that our inventory is constantly changing. There are other X Series models to choose from as well including the BMW X1, X3 and X4. We’re going to dig deeper into the features and performance capabilities available with the BMW X5 to give drivers a better understanding of what this vehicle offers. Although we only carry used vehicles, a lot of the models on our site or only a year or two old. When referencing the BMW X5 specifically, we have models ranging from 2006 to 2016. The used 2006 BMW X5 is equipped with 4.4-liter V-8 engine, which is larger than the remaining, newer models. The newer BMW X5 models are all equipped with a 3.0-liter I-6 engine. All models are set standard with an automatic transmission, and drivers will have the option between rear- or all-wheel drive depending on the model. There are a few variations amongst the BMW X5 lineup on our lot. Drivers will have the choice between the sDrive trim and the xDrive trim for the 2013-2016 X5 models, but all of them are set standard with a lifetime powertrain warranty for added peace of mind. However, the 2006 BMW X5 model does not come with the warranty. A few of the available features for these models include a navigation system, sunroof, leather heated seats and a rear parking aid.